Wednesday proved to be a day filled with lots of news and bonuses! Be sure to read everything carefully so you don't miss out on any great offers. To celebrate the launch of the Starwood and Caesars partership SPG has launched a contest called Take a Spin with SPG where you can win Starpoints, Free Night Awards or an all inclusive grand prize trip to Las Vegas. The contest is open to residents of Canada except those in Quebec and you must be 21 years of age to enter. Enter here. Delta Hotels has partnered up with American Express with this special offer. You can get a $50 American Express Gift Card when you book and stay at participating Delta Hotels & Resorts in Western Canada for 2 consecutive nights. 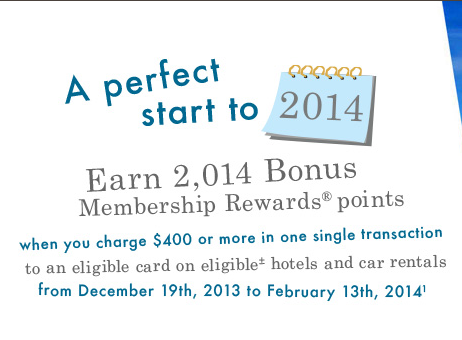 You will also earn an additional $25 American Express Gift Card for each additional night beyond the first two. Full details can be found here. This promotion is a perfect example of why we here at Rewards Canada always stress that you should carry a Visa, a MasterCard and an American Express so that you can take advantage of credit card brand specific promotions! - 1,000 Bonus Rewards Points PER NIGHT for stays at the Best Western Crescent Townhouse Hotel Belfast. More... Until ? Thanks for the insight Symmetre!